For many overseas visitors, Chiba Prefecture will most probably be their first entry point into Japan without them even realizing it. 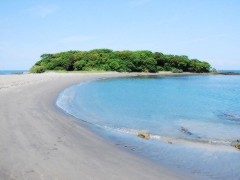 Despite its name "Tokyo Narita International", Japan's busiest airport, is situated deep within rural Chiba providing the perfect gateway to explore this exciting prefecture which is finally beginning to get the recognition it so rightfully deserves. 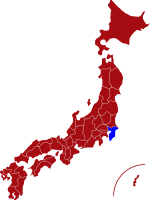 Located next to Metropolitan Tokyo along its southeastern border and running all the way down south to the very tip of the Boso Peninsular, Chiba Prefecture forms a pivotal part of Tokyo Bay to the east and Uraga Channel to the west whilst being surrounded by the Pacific Ocean. 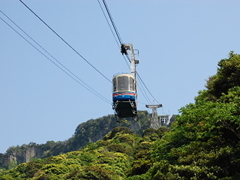 Although the northern part of Chiba is widely known for its modern ultra shopping complexes like Makuhari Messe along with the world famous "Tokyo Disneyland", its real beauty lies further south where the rural landscape offers a vast array of natural wonders worthy of tempting any visitor from afar. Blessed with long white sandy beaches, lush green forests, colourful flowers and stunning sea views, it's easy to be impressed. 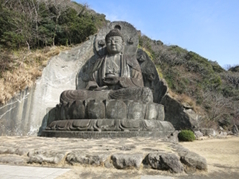 Experience the impressive Mount Nokogiri with its legendry sunsets of the nearby Nihon-Ji Temple that boasts not one, but two Giant Buddhas; both of which are bigger than the more famous and often crowded Kamakura Daibutsu. Further south lies the city of Tateyama which offers more stunning beaches along with some great hiking options where you can enjoy a spectacular views of Tokyo Bay, Yokohama and, weather permitting, the iconic Mt. Fuji. Once visiting this vibrant prefecture you will soon realize that whilst it may not have been on your initial itinerary, you will be more than rewarded for making the effort to come and realize however long you planned to stay it simply won't be long enough. For more information about Chiba prefecture, see their official tourism website. Air - The main airport is Narita International Airport. Click here for its English website. Rail - From Tokyo Station it is possible to reach the southern tip of Chiba in around 90 minutes on the JR Sobu Line, whilst Chiba City in the north can be reached within 40 minutes by rapid express train. 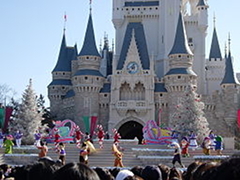 Tokyo Disneyland with its many thrilling rides and attractions, this famous Theme Park continues to draw millions of visitors from all over the world, making it a "must visit" destination for anyone seeking fun, fantasy and excitement. Mt. Nokogiri - Literally meaning "Sawtooth Mountain", this former stone quarry is filled with many interesting secrets and offers breathtaking views of Tokyo Bay, Yokohama and Mt. Fuji. Nihon-Ji Temple - This tranquil temple is Chiba's answer to the Kamakura Daibutsu, offering two Giant Buddha statues positioned at different points along the same mountain. Tateyama Beach - With its vast array of long sandy beaches, this area has many high quality hotels and traditional guest houses making it an ideal location to relax.